I'm going to be honest here - I almost had to put this book down. Not because it was bad - maybe for the opposite reason. It was really good, but terrifyingly so. I've never read a book that shook me as much as this one did. 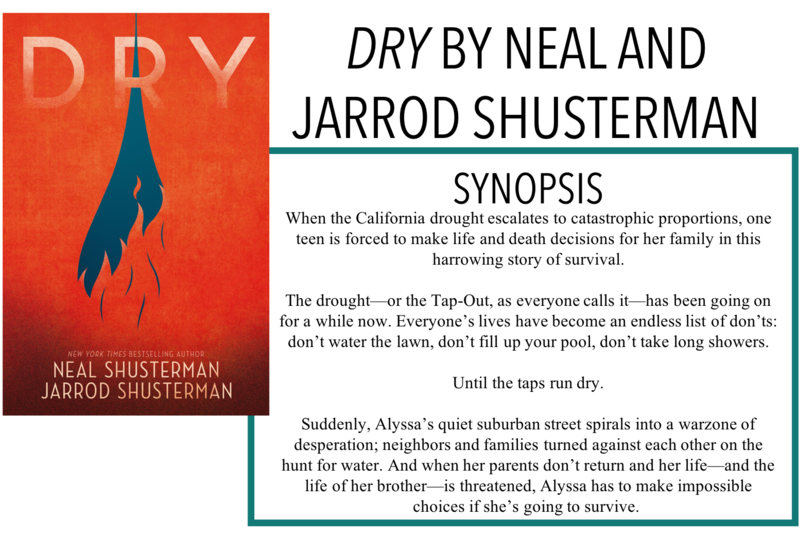 I am back with another book review, Dry by Neal Shusterman and Jarrod Shusterman. The story follows a few characters but mainly focuses around Alyssa and her brother Garrett, as well as their neighbour Kelton and a few others they meet along the way. Across California, the taps have been shut off. The severity of the drought has reached a point where water needs to be conserved and as such, must be restricted. At first, no one really knows what's going on and assumes everything will be alright eventually. Then stores run out of bottled water. People begin to panic and resort to extreme measures to protect themselves and their families. As Alyssa and Garrett try to find their parents who went missing after looking for water, they realize that their weird survivalist neighbours might have been on to something and seek their help, facing deadly consequences along the way. I think what freaked me out about this book so much was the realness of it. I don't read a lot of survival stories - the extent to which I do read focuses on apocalypse or dystopian stories where the disaster has already happened. This book shows the disaster as its happening. And in this case, it's not an infectious disease or corrupt government that causes the problems (although there is some of that), its water. A resource so many of us take for granted every single day. That just made the book really hard to read - it made me uncomfortable in my way of life of not really paying attention to things like my water consumption. The story is phenomenally written, I think both Shusterman's did a great job of weaving together a story that was riveting enough without becoming unrealistic - in fact, that realness is probably the best (and arguably worst) part of the book. I also really liked how this book is a standalone so you get the entire story arc in one go, and you don't have to wait for the next book to see how things end up. The ending was satisfying enough but not unrealistically so, and I think many of the characters are forever affected by the events of the book. Where things kind of fell apart for me was with the characters. I think I was just so invested in the story outside of them that I didn't really care a ton about what was going on with them, especially the more peripheral ones like Jacqui and Henry. I was concerned about the characters because they were in this situation, but I wasn't necessarily concerned because of who they were. Other than Garrett, I didn't really feel much towards them individually. Overall, I've really gotten into Shusterman's writing lately and I really enjoyed this one!